The incredible close-up magic of Seth Grabel is coming to Tahiti Village! You won’t believe your eyes when magician extraordinaire Seth Grabel brings his bag of tricks to Tahiti Village beginning Jan. 14. Seth will perform mind blowing sleight of hand magic every Sunday at 4 p.m. in our Kahiko Room on the second floor above Denny’s. A semifinalist on America’s Got Talent, Seth has been wowing audiences with his visionary approach to magic on television and stages across the country for 20 years. Here at Tahiti Village, this versatile performer will demonstrate the art of sleight of hand to mesmerizing effect. The intimate Kahiko Room is the perfect setting for Seth’s brand of close-up card wizardry and the audience participation that is a large part of his family-friendly show. Tickets are available at the concierge (702) 440-6915 or as part of a special room package on our website. 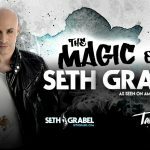 Don’t miss the incredible Seth Grabel on your next visit to Tahiti Village! 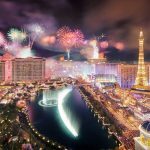 Fireworks galore and abundant activities highlight New Year’s Eve in Vegas! Magician Seth Grabel to make official Tahiti Village debut this Sunday afternoon. It’s interactive! It’s early! It’s kid friendly!